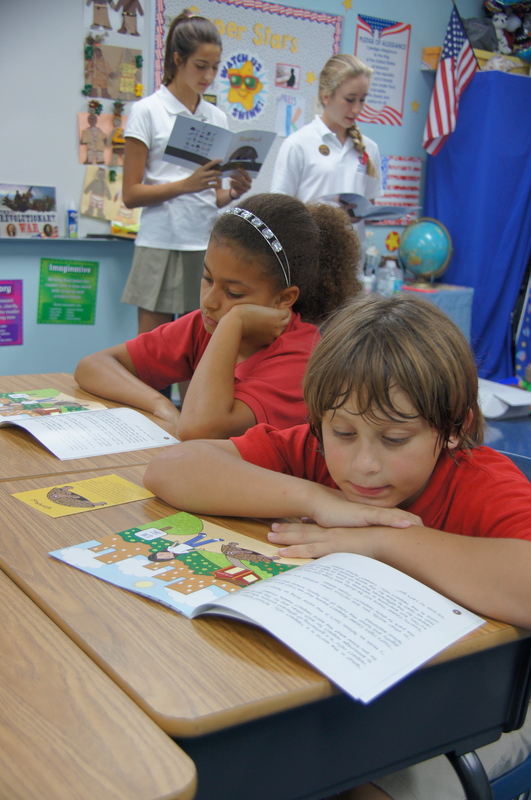 One of the many things that makes Grandview unique is the inclusion of character education in the curriculum. Beginning in September, this portion of our curriculum will be more visible as we begin a partnership with Cloud9World, a character trait education program for elementary and pre-kindergarten students. The mission of Cloud9World, founded by an inspired group of professionals and mothers, is to promote positive ethical values as a crucial part of childhood education– and to do so in a fun format that captures children’s imaginations. The program features stories starring a troop of lovable animals that explain character traits such as integrity, respect, perseverance, and loyalty. 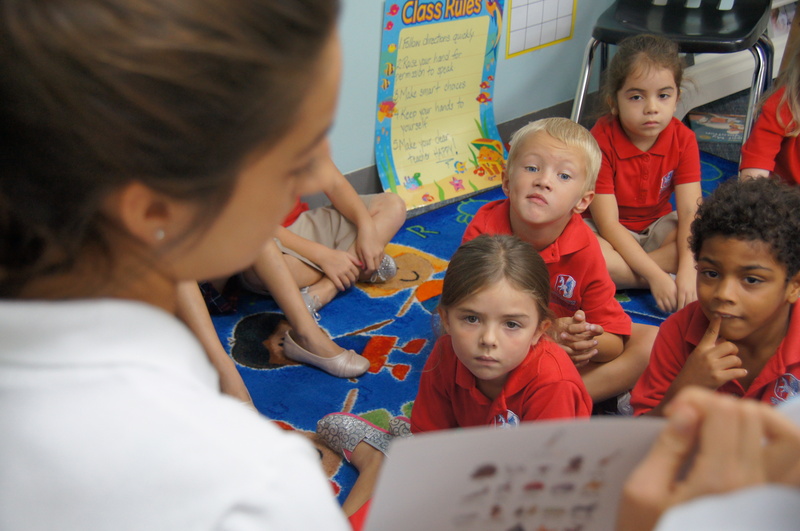 Each month, our lower school students are introduced to a new character trait. The whole school wears stickers displaying the trait, upper school students visit lower school classrooms and read that month’s story, and lower school students receive their own book to take home and read with their parents. Posters depicting the trait adorn the walls in lower, middle, and upper school classrooms, and the the trait is incorporated into developmentally-appropriate curriculum throughout the month. At the end of the month, students who exemplify that trait are honored during the lower school convocation. A ninth grade student reads to our first graders. 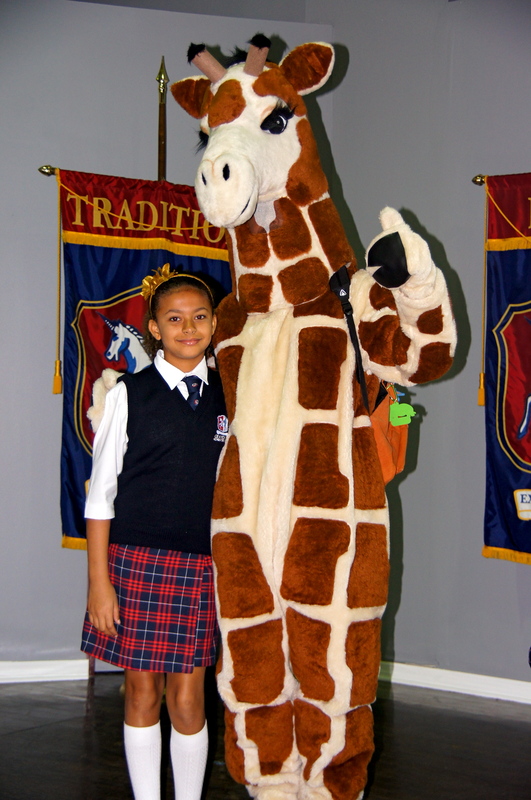 To kick off this new program, Grandview received a visit from Jade the Giraffe. Jade is the main character in a story about integrity, and was a hit during our first lower school convocation of the new school year. To learn more about Cloud9World, visit www.cloud9world.com. Tags: Character Education. Bookmark the permalink.